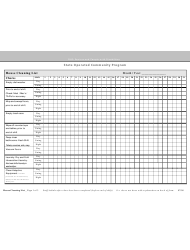 This house cleaning schedule was designed to be used with the Seniors and People with Disabilities, State Operated Community Program (SOCP) initiated by the Oregon Department of Human Services (DHS). 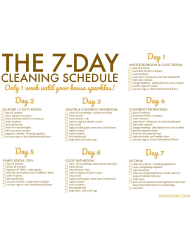 This minimalist weekly cleaning schedule will help your house stay clean throughout the week with minimal effort required. 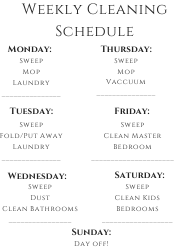 Hang this poster on your wall to have easy access to the list of simple chores that need to be done daily throughout the week. 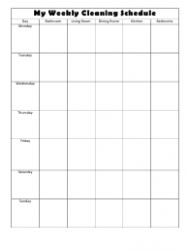 Customize this blank cleaning schedule to list the chores that need to be done every day by organizing tasks room-to-room. 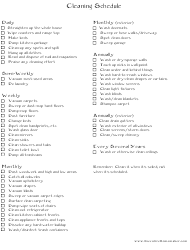 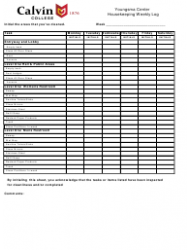 This template lists household cleaning tasks that need to be done on a daily, weekly, semi-weekly, monthly, and yearly basis. 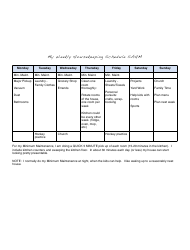 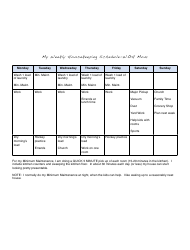 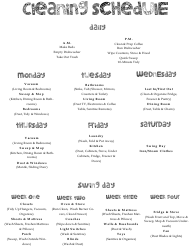 This sample housekeeping schedule was made to help work-out-of-the-home (WOH) moms keep their house looking clean. This sample weekly cleaning schedule was designed specifically for stay-at-home moms (SAHMs).